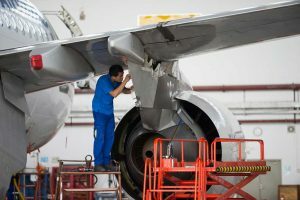 A peek inside the precise and highly-trained world of airline mechanics. 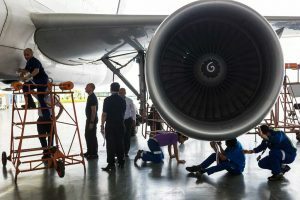 What image springs to mind when you think of an airline mechanic? A burly figure in oil-stained overalls and permanently dirty fingernails? Lots of clanging tools and loose bolts? The reality, as mechanic Soutsakhone Lounsengchanh discovered early in his career, couldn’t be further from the truth. 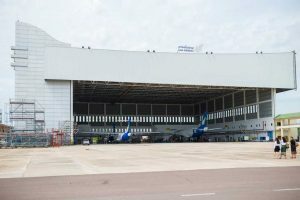 It’s a standard Wednesday morning at Wattay Airport in Vientiane, but the atmosphere in the hangar out the back of the building is far removed from the low-level-stress hum of the arrivals and departures lounges, with all their exhausted queues of people and clattering suitcase wheels. Here, amid soaring steel beams and scaffolding, aircraft stand in orderly rows, while teams of technicians in neat blue overalls are quietly absorbed in the gaping innards of whichever plane is up next. The hinges swing back easily, and the mass of coiled steel, knobs, lids and wires inside look shiny and clean. 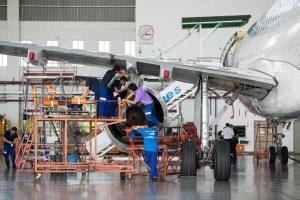 “Every aircraft is checked and maintained each day, according to the documentation provided by the engineering division,” Soutsakhone says. It’s a long way from where he found himself more than five years ago in his first career choice. He was a qualified English teacher working part-time in Vientiane, having finished a degree in English pedagogy. “I could see that the level of my work would never change, that I would never be able to enhance my professional experience,” he says. 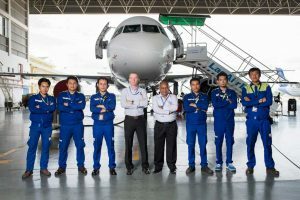 All qualified technicians must first have a technical background, as well as excellent English skills, so Soutsakhone spent his first two years as an unskilled assistant to the airline’s mechanics. He then had to complete over 200 hours of basic training, but as Laos has no university, college or school that can provide this kind of training, he travelled to Vietnam to finish his basic studies. 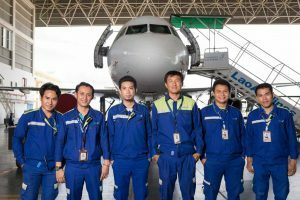 He has since done further training in Singapore, Germany, Thailand, and Japan, and has been working as a qualified technician for Lao Airlines Engineering Company, a joint venture with between CIT Lao and Lao Airlines. 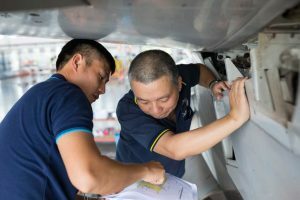 He’s one of 20 staff doing base maintenance on Airbus 320 and the ATR72-500/600, although he’s one of the few who can work on both. He says many people would be surprised at how methodical, technical and complicated the work is – the word “mechanic” is very misleading.“It’s different to being a car or motorbike mechanic – we follow the documentation from manufacturers or authorities, perform all the checks exactly and sign a lot of documents,” he says. For now, he works six days a week, and has a superior ultimately sign off each aircraft, but, with his training reviewed every five years, his ambition is to rise to the level of his superiors, with even more responsibility. “They have to evaluate your experience, your skills and your knowledge regularly,” he says, adding that he has no regrets about changing his career. “I never thought about aeroplanes when I was a young boy, but when I was choosing a profession, like many people, I didn’t know what it would be like until I started,” he says. And he says now, looking back, he can see that teaching isn’t so different when it comes to the learning process. “Even as a teacher, you have to keep improving your knowledge, because now students more than you!” he says.